On January 21, 1998, one male volunteer fire fighter (the victim) died of smoke and soot inhalation and a second fire fighter escaped without injury while attempting to determine the origin of fire in a supermarket. A volunteer Engine Company composed of three fire fighters (Lieutenant, Captain, and fire fighter), responded to a structure fire at a local supermarket. When the Engine Company arrived at the fire scene, the Lieutenant reported heavy black smoke emitting from the ventilation system at the rear of the store. Equipped with full turnout gear, self-contained breathing apparatus (SCBA), ax, light, and portable radio, the Captain and the victim entered through the front doors of the store to determine the fire’s origin. Both fire fighters proceeded through heavy black smoke to the rear of the store, became disoriented, and radioed for help. The victim ran out of air and died from smoke and soot inhalation while the Captain managed to escape through the front of the store. Rescue attempts were made but failed due to heat and smoke. ensure that backup personnel stand by with equipment, ready to provide assistance or rescue. Figure. Supermarket where one firefighter lost his life. On January 21, 1998, two male volunteer fire fighters, a 25-year-old fire fighter (victim), and a 37-year-old Captain, entered a local supermarket that had heavy smoke emitting through the rear ventilation system. The two fire fighters entered the store through the front door and proceeded to the rear, where they became disoriented. The victim died of smoke and soot inhalation and the Captain barely escaped. During the week of February 2, 1998, the Chief of the Trauma Investigations Section and a Safety Specialist conducted an investigation of this incident. Meetings were conducted with officers and fire fighters from the volunteer fire department, including the Captain who was able to escape from the store. Photographs and measurements were taken of the incident site, dispatch times were obtained, and telephone interviews were also conducted with officials from the State Fire Marshal’s office. The 30-member volunteer fire department involved in the incident serves a population of 1,200 in a geographic area of 5 square miles. The fire department requires all new fire fighters to complete Fire Fighter Level I training, which consists of 36 hours of training mandated by the State of West Virginia. The required training is designed to cover personal safety, forcible entry, ventilation, fire apparatus, ladders, self-contained breathing apparatus, search and rescue, hose loads, and nozzles. The victim had completed Fire Fighter Level I training and had approximately 11 years of fire fighting experience. Although nine volunteer fire departments were involved in this incident, only those directly involved up to the time of the fatal incident are mentioned in this report. On January 21, 1998, at approximately 1030 hours, an employee at a local business was informed that smoke was detected at a supermarket adjacent to the employee’s place of employment. The employee was a Lieutenant in the local volunteer fire department. The Lieutenant proceeded to the supermarket and made sure the supermarket and surrounding buildings were evacuated and all delivery trucks were moved from the rear of the store. The Lieutenant then received a ride from a passing motorist to the fire station. There, he was met by the Captain and a fire fighter who had been notified by the dispatch paging system. At 1040 hours dispatch was notified to place a second volunteer department on standby status. The Lieutenant, the Captain, and a fire fighter responded to the scene with Pumper 420, and arrived at approximately 1046 hours. At approximately 1049 hours, backup was requested and Engine 421 arrived on scene at 1052 hours. By 1107 hours, a total of 9 departments, approximately 20 pieces of rolling equipment, and 75 to 90 fire fighters had arrived at the fire scene. The site of the incident was a one-story supermarket measuring 120 feet wide by 180 feet long, located in a shopping plaza. The exterior of the supermarket was of masonry and brick construction, with a steel truss roof system. The roof was covered with metal sheet roofing, except for a section which was covered with synthetic rubber. The structure was built on a concrete slab foundation and was accessible from two front doors, a side door, and the rear delivery doors. Two additional businesses were contained within the structure of the supermarket. When the first fire department arrived on the scene at 1046 hours, the Lieutenant reported that heavy black smoke was emitting from the ventilation system at the rear of the structure. Upon arrival Pumper 420 laid a 5-inch line to a hydrant located towards the rear of the incident site. The Lieutenant was the driver of Pumper 420 and the pump operator according to department procedures. As the Lieutenant made the hose connections to the hydrant, additional manpower arrived on the scene, including the victim, who worked at a local business next to the shopping plaza. The Captain from Pumper 420 went into to the front entrance and found good visibility in the store, with the interior lights on, and light smoke about 1 foot thick across the ceiling. The Captain exited the store and returned to the pumper, where he called for additional backup. The fire fighter victim approached the Lieutenant on Pumper 420 and requested turnout gear and an SCBA. The victim, a former employee of the supermarket, knew the layout of the structure and requested that he be allowed to assist the Captain in completing an internal evaluation to locate the origin of the fire. The Lieutenant (Pump Operator) would remain on the outside of the structure. The Lieutenant gave the victim his turnout gear and an SCBA. Between 1055 and 1100 hours, the Captain and the fire fighter (victim)—equipped with full turnout gear, SCBA, ax, hand light, and lights attached to their helmets—went to the front of the store and entered through the front door. When they entered the store, conditions had deteriorated. Heavy smoke obscured visibility, so they crouched/crawled approximately 15 feet into the store (see Figure). Crouching/crawling to the right they encountered a wall. They decided to stand and walk along the wall, which was approximately 5 feet long. Coming to the end of the wall, they crouched back down and began to crawl down an aisle toward the rear of the store. They felt it was safe to proceed, since they did not feel any increase in temperature. As they crawled toward the rear of the store, with extremely poor visibility, the two became separated approximately 2 to 3 feet. The victim reached an oversized steel hinged door that led to the meat room and storage area. As the victim started to enter, he stood up and was repelled by intense heat. The heat apparently panicked or startled the victim, who immediately turned and bumped into the Captain, stating, ” it’s too hot, we have to get out of here.” The victim grabbed the air hose on the Captain’s SCBA and pulled him in a direction which the victim apparently thought was the exit. Both fire fighters, moving at a fast pace through heavy black smoke, ran into a wall. At this point the victim realized they were lost and requested that the Captain radio for help. Feeling around in an attempt to find their location, they were able to determine that they were in the general area of the meat section. At approximately 1107 hours, the Captain used the portable radio to call for help, stating that they were in trouble and could not get out. At this time the low-air alarm on the victim’s SCBA was sounding. Both fire fighters were now in a crouched position to await help when the victim told the Captain that he was out of air. The Captain told the victim to pull his SCBA air line from his regulator, and put it inside his jacket. The Captain began asking the victim questions about their location when he realized the victim was now unresponsive. The Captain stated he began to crawl to his left, bumping into shopping carts and a product display. His attention was drawn to a distant light. The Captain crawled toward the light, discovered an opening, and exited between 1108 and 1112 hours. He was able to escape without injury, exiting through the opposing front entrance from where he had entered (see Figure). The Captain stated that heat was not a problem as they attempted to exit, and that it was unclear if the victim was equipped with a personal alert safety system (PASS) device, but was sure he (Captain) did not have a PASS device on. Incident command had directed search and rescue efforts for the two fire fighters who were in the structure at approximately 1107 hours. The Chief from the local department and a Lieutenant from a different volunteer department went in through the same door as the victim, with a 1½-inch uncharged line. They advanced approximately 15 feet before being distracted by one of their low-air alarms, which forced the two to retreat and exit the structure. Additional attempts to enter through the rear of the structure were coordinated, but were unsuccessful due to the heat and heavy smoke. The search and rescue was terminated approximately 1 hour later. Positive pressure ventilation fans were placed in the doors to force fresh air into the structure after the Chief and Lieutenant exited. At 1300 hours, the State Fire Marshall ordered the victim’s department off the fire ground. The victim was eventually found and was removed from the interior of the supermarket, at approximately 1500 hours. The medical examiner’s report listed the cause of death as smoke and soot inhalation. Discussion: Fire fighters who enter smoke-filled enclosures should be equipped with a safety line or hose line in the event that a fire fighter becomes disoriented or trapped. By using a hose line the fire fighter is able to determine the direction of exit by the couplings that connect two hose lines together. The male coupling signifies the exit direction. Discussion: The PASS device is a small electronic device worn by the fire fighter which will emit a loud and distinctive audible alarm if the fire fighter becomes motionless for more than 30 seconds. The fire fighter can also activate the alarm manually if needed. A fire fighter who becomes trapped or disoriented should manually activate the PASS device. The captain was not equipped with a PASS device and it was unclear whether the victim was equipped with one. If the victim was equipped with a PASS device, the fire fighters never heard it sounding. Fire fighters should be trained in this system and should be provided with periodic refresher courses to review policies and procedures. Fire fighters must always be fully aware of standard operating procedures, and their individual roles and responsibilities. This recommendation outlines the areas covered by most departmental policies and procedures; however, individual department systems will vary due to specific needs and services. Discussion: During interior structural fire fighting (in Immediately Dangerous to Life or Health (IDLH) atmospheres) self-contained breathing apparatus is required and at least two fire fighters must enter and remain in visual and voice contact with each other at all times. In addition, two fire fighters must be on standby if two fire fighters are engaged in interior structural fire fighting in the burning building (“two-in / two-out”) to provide safety. The two exterior fire fighters should form a rescue team that is stationed outside the hazardous area. The rescue team should be trained and equipped to begin a rescue immediately if any other fire fighters in the hazardous area require assistance. A dedicated rapid-response team may be required if more than a few fire fighters are in the hazardous area. 1. Essentials of Fire Fighting, 3rd edition, The International Fire Service Training Association. Fire Protection Publications, Oklahoma State University. Edited by; Wieder M, Smith C, Brackage C, 1995. 2. Morris GP, Brunacini N, Whaley L . Fire ground accountability: the Phoenix system. Fire Engineering 147(4):45-61. 3. National Fire Protection Association. NFPA 1500, 1992 Edition, Standard on Fire Department Occupational Safety and Health Program, National Fire Protection Association, Quincy, MA. 4. 29 Code of Federal Regulations 1910.120(q)(3)(vi), Hazardous waste operations and emergency response. Figure. 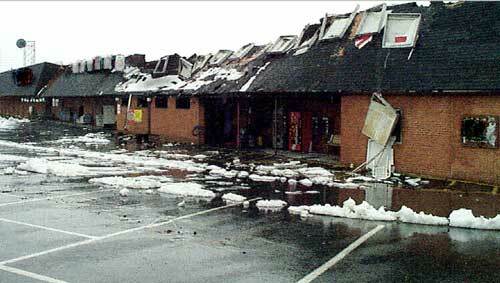 Supermarket where one fire fighter lost his life.